The AGITG has a rich history of conducting practice changing clinical trials and cutting edge translational research. By conducting smaller scale pilot trials we have the necessary evidence to support funding submissions. Our track record in publishing clinical trial research results and scientific outputs can be viewed here. Concepts are reviewed by the Upper & Lower GI Working Parties and Consumer Advisory Panel. We encourage investigators to bring research concepts forward through various avenues and opportunities offered by the AGITG. 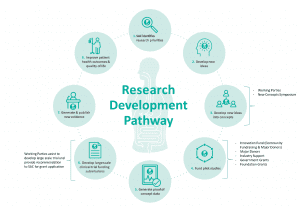 Concepts that address the research priorities are particularly encouraged however all concepts addressing clinical questions in GI cancer are considered. Consumer Advisory Panel, advising on general research directions and priorities, from the consumer’s perspective.